The new MetPrep web site has been designed especially to help you find what you want more quickly and easily. We are also endeavouring to make this more of a resource to aid you in your daily tasks by supplying you additional information when required. We now offer an online consumables ordering facility as well as the ability to generate a consumables list / quotation as a PDF. Click here to register or login to your account. You will need to include your billing and delivery address to ensure this information appears in your quotation. To take advantage of this online PDF service please ensure you use a modern browser (such as Chrome or Firefox) as this feature is not compatible with Internet Explorer. Whilst the on line PDF options are not compatible with Internet Explorer the on line ordering option is compatible with Internet Explorer. Once you have logged in to your online account and added your items to your basket you will be able to click the ‘GENERATE CART PDF/QUOTATION’ button to download a PDF quote listing the items in your cart and your company details. Those just requiring a list of their required consumables in PDF form can just click this button after filling their shopping basket without the need to log in to an account. To place your order directly to the MetPrep office just click ‘PROCEED TO CHECKOUT’ and include your order number in the Order / Notes area at the bottom of the page. Your order will then be placed directly with MetPrep and processed as usual. For those wishing to pay immediately by credit card, please proceed as above and contact the office by telephone on 02476 421222 and they can take a credit card payment for the generated order. Currently we cannot take credit card payments online. We have improved our Products pages to give further information on our range of ATM products with the ability to download the associated brochure PDFs. There is additional information and literature where applicable. We have also given an overview of the Leica Microscopes, Leica Imaging software and our range of Qness hardness and Microhardness testers. For further information on our extensive ranges please just contact us for further information. For those requiring a service contract or assistance with any equipment problems please see this area for the contact details of our Service department where they will be happy to assist. In addition we have updated our Downloads & Support page to provide you with further useful information. There are a series of tried and tested Preparation Procedures to aid you in your metallographic preparation as well as the usual Safety Data Sheets. The safety data sheets can be downloaded directly from this page or you can also download them using the green SDS button associated with the consumables description. In addition to the green SDS button we also have a black TDS button which is for our more detailed Technical Data Sheets associated with that product group. Again these can be accessed via the TDS page in support or from product group using the black TDS button. We have also included some typical etchants used by our customers which may aid you in revealing your assorted microstructures. MetPrep do not supply etchants of any kind but we feel this area may still be of use to you. As usual we have also included details of our Road Shows taking place regularly around the UK which you are welcome to visit and we also have information on our popular Vocational Training Courses. Keep your eyes on these pages if you are interested in these events as we update them on a regular basis. For those of you looking for Photomicrographs to brighten up your laboratory we have provided 27 of our favourite Images in A3 Poster form for you to download and use as you wish. All posters are 300dpi and ready to print. In December this year we have also added an A1 poster describing Metallography as well. This is also available from our Download & Support page. For those wishing to contact us we have several options here Contact Us – and we will respond as soon as is possible. We have tried to make this site concise and easy to use as well as being useful as a regular resource for laboratory personnel. In the event you notice anything that appears incorrect or misleading please feel free to let us know. We have checked carefully but we are only human. 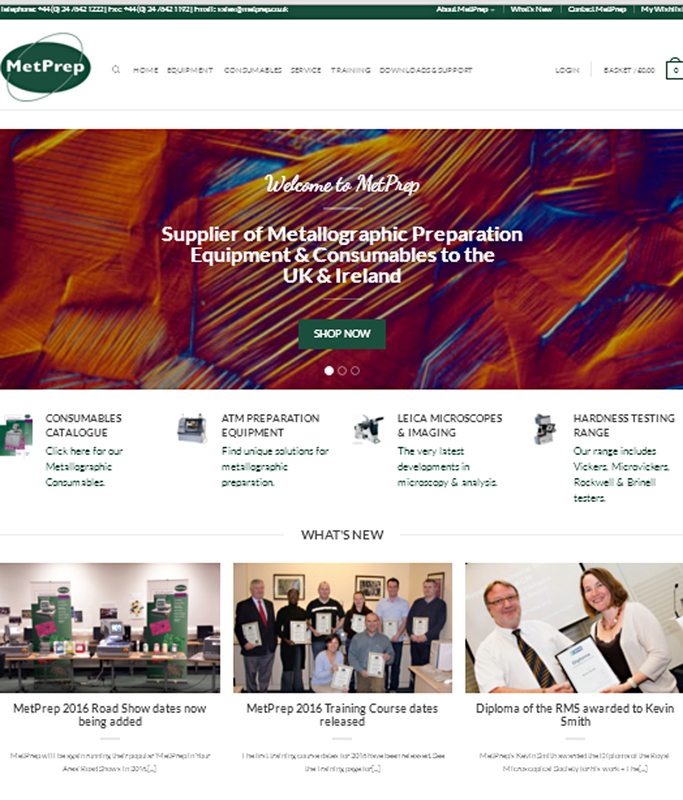 Please send all feedback to the webmaster Kevin Smith at kevin@metprep.co.uk who will address any issues. If you have any questions regarding the generation of your online account please contact your representative for further assistance. In the event your representative not being available please contact Tara Carter at tara@metprep.co.uk. We hope you find our new website useful and enjoyable and we look forward hearing from you in due course.